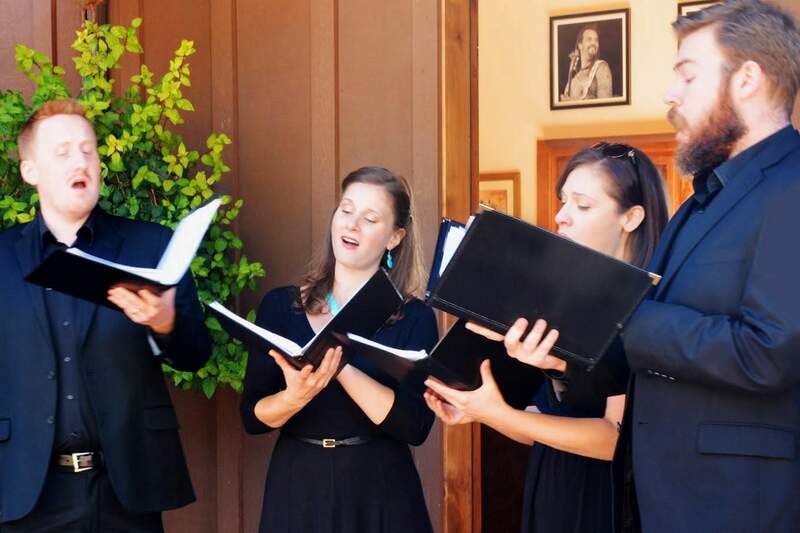 Quadrivium, from left, Erik Gustafson, Kerry Ginger, Charissa Chiaravalloti and Ryan Downey, entertain guests at a San Juan Symphony FUNraiser at the home of Moni and Jonas Grushkin at the end of September. Students from Tennille’s Violin House in Farmington perform at San Juan Symphony’s FUNraiser at the end of September at the home of Moni and Jonas Grushkin. Their teacher is Tennille Taylor, who is the principal second violin with the symphony. What is better than a beautiful fall day, a lovely home with fabulous views, live music from talented musicians, great munchies and a libation or two? Not much I can think of, and I imagine the guests at the San Juan Symphony’s FUNraiser would agree. Held at the home of Moni and Jonas Grushkin on the rim of Florida Mesa in late September, the event gave guests a chance for casual chats with Thomas Heuser, the symphony’s new music director. 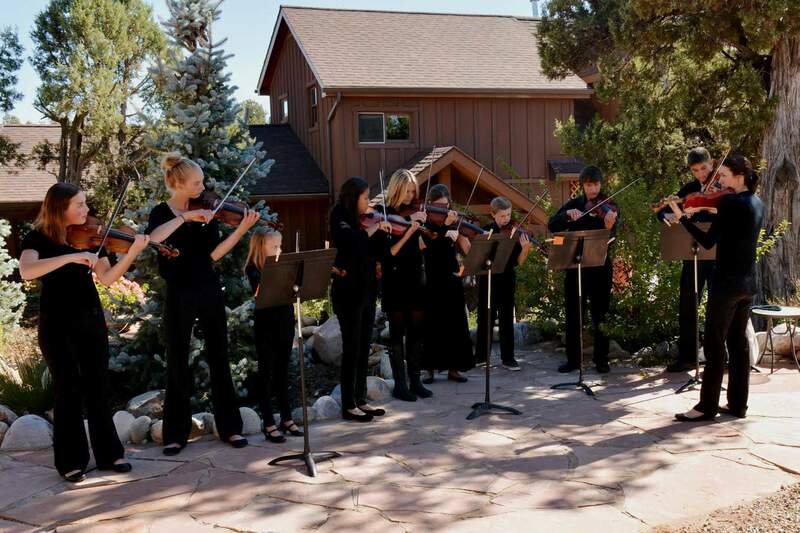 The afternoon was a kickoff the 31st season, beginning with second principal violin Tenille Taylor’s students from Tenille’s Violin House in Farmington – the symphony is regional, performing in Durango and Farmington – in the upper gathering place of the Grushkin home. Guests moved to the lower patio to hear Quadruvium, a new quartet featuring some of the finest voices in the area, including Eric Gustafson, Kerry Ginger, Charissa Chiaravalloti and Ryan Downey and the San Juan Symphony String Quartet, which includes Brent Williams, Katharine Jetter, Haley Cunningham and Taylor. In the living room, our Irish songbird, Gemma Kavanagh, sang, accompanied by Linda Mack Berven. Kavanagh will be a soloist with the symphony at its Nov. 12-13 performances of Brahms’ German Requiem. The music finished in Jonas Grushkin’s Photogenesis studio with Casey Reed, concertmaster of the symphony’s Youth Orchestra. Cheryl Folwell, who joined the symphony’s board this year, made sure the attendees were fueled with artichoke squares, chicken salad on pumpernickel squares, assorted cheeses and fruit and maple syrup-apple chicken sausage bites with pretzel sticks as toothpicks – genius, by the way. I am always trying to figure out what to do with toothpicks and skewers at parties – call me the social columnist with no social graces. Chuck Norton Catering donated one of his beautiful poached-salmon platters and the repast ended on a sweet note – pun intended – with Mexican wedding cookies and brownies. Stan Crapo of Star Liquors once again generously stepped up and donated the beer and wine. HHHA reader recently asked me why I so often include business donors and sponsors in column items, and this seems like a good place to answer that question. A community is stronger when everyone pitches in, and we certainly have many active volunteers whose efforts make a tremendous difference. That’s why I try to include the names of people on organizing committees when I have them. But the number of times in a week that local businesses are hit up for donations, whether it’s for a silent auction, a live auction, a door prize or a party favor – is astonishing. While they don’t give to everything, most businesses here try to accommodate as many nonprofits as is fiscally possible. That generosity deserves to be noticed. And I hope thank them for caring so much for our community.